The weather may be getting colder and the nights longer, but we have some fantastic promotions to warm you up as we head towards winter. Purple Haze cannabis is a Mostly Sativa plant from Holland. Positronics Seedbank breeder. Produced from Mexican, Colombian, South Indian and Thai varieties. Incredible resin development. This medium-grade outdoor Sativa is very, very dark purple, almost black, with medium green leaves, brownish-red hairs, and lightly coated with crystals. When breaking it up, the buds look like pieces of hash, they are THAT dark! The stems taste like peppermint, and buds smell like chlorophyll, very plant-y (like fresh cut grass). When smoked, the bud tastes like a high grade outdoor Thai. Good for passing around at a campfire! The high creeps up on you, is spacey, and a bit uplifting. Much better out of a bong than a joint, or pipe. 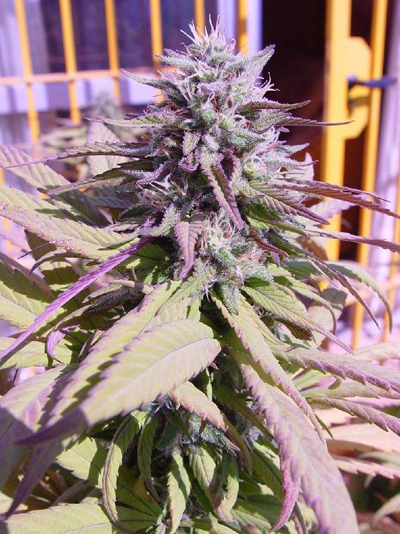 Vivid purple with bright green leaves and an ample coating of bright orange hairs. Extremely Aromatic with smells ranging from heady inscense to a woodsy, almost Sandlewood aroma, to a deeply earthy Haze undertone. Very satisfying olefactry experience indeed. The most 'Purple' taste of any medicine I've ever experienced. Grape candy on the inhale and earthy Sandlewood inscense on the exhale. Almost exactly like the Smell. Very soaring, rushy, euphoric effect that is not at all edgey or uncomfortable. This medicine made me fill very "large" and floaty like a big baloon in the sky. Very long lasting with amellow easy comedown. Very strong with pronounced psychedelic imagery and soaring,rushy body high. Not for the faint of heart, at least in the initial stages of the experience,before eventually (could be hours) the introspective mellow indica high takes over. cannabisMJseeds.com 2009-2015. Please link us if copy!